The fascinating story of how the 82nd Knight of the Garter came to be nominated in 1390 during the period of a truce in the Hundred Years War can be read in Froissart’s Chronicles. 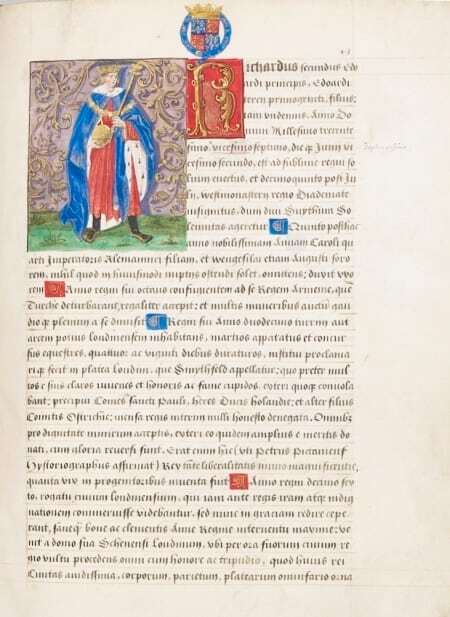 It is also mentioned in the entry for Richard II in the Black Book of the Garter, which is illuminated with a conjectural portrait of the king [SGC G.1]. The young Count William of Ostrevant who was married to a daughter of the Duke of Burgundy, an ally of the King of France, had fought against the English. He was later to succeed to the titles of Count of Hainault and Holland and Duke of Bavaria held by his father Albert, himself nominated to the Order in 1398 as the 90th KG, who died in 1404. William was related to Richard II through his grandmother Philippa of Hainault, wife of Edward III. Richard II had been persuaded by his uncle John of Gaunt to call a parliament at Westminster at which a truce with France had been agreed and signed. A number of English knights had then attended festivities in Paris in celebration and informed the king and his three uncles about them. Richard then commanded that feasts and a grand tournament be held in London, following Michaelmas, and that proclamations be made in England, Scotland, Germany, Flanders, Brabant, Hainault and France. Sixty knights, accompanied by sixty noble ladies, richly ornamented and dressed were to take part. The knights were to joust courteously, with blunt lances, against all comers; the most gallant of the foreign challengers would be awarded a ‘rich gold crown’ on the judgment of the ladies. The gallant young Count of Ostrevant was keen on tilting and wanted to meet and honour his cousin, the English king, and the king’s uncles. William’s father tried to discourage him but William insisted that he was going to England to tilt, to enjoy the feast and to visit his cousins whom he had never met; not to form an alliance. His herald communicated his acceptance to the English king. Having crossed the Channel and paid his devotion at the shrine of Thomas a Becket at Canterbury, he proceeded with his entourage of knights and squires to London. The tournament was held at Smithfield. On the first day of the tiltings, twelve English knights faced foreign challengers. The Count of Ostrevant arrived towards evening and was kindly received by the English lords. Dancing and feasting followed at the palace of the Bishop of London at which Richard II’s queen and her ladies were lodged. The next day the sixty English knights were to joust with their challengers. The entry of the royal party and of the English knights to the tournament field was to be followed by that of the Count of Ostrevant with a large company of knights and squires armed for tilting. At the end of the day’s jousting, the prize was awarded to the young count, who had ‘far eclipsed all who had tilted on that day’. Five days later, following two more days of lesser jousting, the king, his court and knights departed for Windsor which had a ‘handsome castle, well-built and richly ornamented’. The entertainments, dinners and supper provided by the king were magnificent as ‘he thought he could not pay enough honour to his cousin the Count of Ostrevant’. The count was solicited by the king and his uncles to become a companion of ‘the order of the blue Garter’ as the Chapel of the order’s patron, St George, was at Windsor. Having consulted two of his associates, who did not discourage him, the count returned to the king and was admitted a Knight Companion of the Order of the Garter. The French knights were greatly surprised, saying that the count’s heart was more inclined to England than to France in accepting the Garter, the device of the king of England, although they conceded that he was well beloved of the king of France and all the royal family. However, Froissart comments that there was no reason to blame the count: he had accepted the Garter to oblige his English cousins and, on occasion, to be a mediator between the two countries. Rumours of these happenings spread to the French court, rumours which became exaggerated: the Count of Ostrevant had gained the prize at the tournament in preference to many other foreign knights, he had praised the English loudly and, in accepting the Garter and taking the oath, he had become the liege-man of the king of England. No Knight Companion of the Order could be admitted without swearing an oath never to bear arms against the crown of England, an oath that the count had supposedly taken without reservation. The French king declared that the ‘Hainaulters’ were always more attached to England than to France. He commanded the count to come to Paris and to do homage for the county of Ostrevant, on penalty of dispossession. The count assembled his most confidential counsellors and after consulting his father ‘sent such humble and discreet letters to the king of France and his Council as greatly pacified them’. So ends Froissart’s fascinating account of an incident in the later years of the age of chivalry.